Hello followers of our Bandon Real Estate website CoastProperties.com! 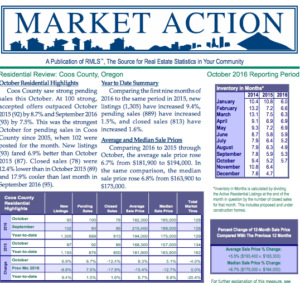 Here’s the most recent sales statistics directly from the Regional Multiple Listing Service for real estate sales in Coos and Curry Counties. For further information on this report, please contact one of our expert Bandon real estate brokers to get the complete scoop of the Bandon Real Estate market. Contact us for expert advice in regards to purchasing real estate or if you are planning on selling your property in Bandon and surrounding areas! Call 541-347-4533 today! Our team offers complete knowledge of the Bandon Real Estate Market with many years of combined experience. Put us to work for you!